In a capitalist mode of production, systems are organized into production and distribution in the societies adopting the model. There are two variables that are encountered simultaneously in a capitalistic mode of production. Karl Max stipulates that this production model contains the means of production. When referring to means of production, it is worth classifying the production requirements in the context of production. Therefore, these refers to factories, machineries, raw materials and labor among other factors of production that are essential for the production of a goods and products. The produced commodity contains both value and use-value. Commodity value refers to the merits that a user enjoys through buying the product. There are any aspects that are used for measuring value. From the perspective of the consumer, value is defined by the durability of the commodity relative to its price. On the other hand, the use value is the value that is delivered from the original value. The utility of a thing makes it a use value. A commodity, such as iron, corn, or a diamond, is therefore, so far as it is a material thing, a use value, something useful. This property of a commodity is independent of the amount of labor required to appropriate its useful qualities. When treating of use value, we always assume to be dealing with definite quantities, such as dozens of watches, yards of linen, or tons of iron. In a capitalistic economy, goods and products must be manufactured encapsulating the use value in order to drive sales. The utility derived from consuming the product is what use value entails. The economic concept behind the existence of this value is correlated to the mode of using the product. This value is related a cash value of the same amount and cannot be defined by an intrinsic value. In a capitalistic economy, the aim is driving clients to buy more products and increase the return on investment. As such, the products and goods produced are products of concrete and abstract labor. If on the one hand the coat ranks as nothing but the embodiment of abstract human labor, so, on the other hand, the tailoring which is actually embodied in it, counts as nothing but the form under which that abstract labor is realized. Individual ownership of the means of production is the basis upon which capitalistic economy is founded. Therefore, the owners of the factors of production must leverage low costs of labor production in order to stay competitive in the market. In this regard, the capitalist only pays the worker just enough money to keep them alive and productive. For example, cases of strikes are evident in the modern day and age in capitalistic economies. These cases are aggravated by the lack of satisfaction in the rate of payment of the workers. From an abstract aspect, labor refers to the economical valuable time of the worker while from a concrete perspective; it refers to a particular activity with a specified and useful effect. Concrete labor becomes, therefore, the medium for expressing abstract human labor. For example, concrete labour like tailoring, produces the equivalent of the product of weaving. In the former, human labor is used to add value to the commodity. The capital value of transferring from inputs to outputs is, therefore, persevered. In a simplified context, labor from this definition can be seen as an activity that aims at creating and maintaining the economic value. The realization of this value is done once the product is sold, and a monetary value is achieved. On the other hand, from the context of concreteness, the effect of labor and its usefulness in the production of products is visible. In this essence, labor is stipulated as an activity that is used to create use value. Once goods are produced using these two forms of labor, the exchange contains simple circulation and capital. Simple circulation is cash float in simple terms. This is the amount acquired and is used to learn and oversee the daily running of a business or organization. This money has an economic value as it stipulates the success of the business in its ability to break even, earn profit and even retain capital. When the simple circulation float is achieved, and the business enjoys surplus earnings, this is the beginning of the foundation of capital. Capital in this regard can be seen as the money ploughed back to the organization to enhance its performance. It is an essential factor of production that businesses venture to acquire in an attempting of meeting expansion and maintenance strategic goals and objectives. The induction and accumulation of capital and wealth start from the ability to simply circulate the daily earnings of the business. To ensure that this loop continues, the produced goods and services must satisfy the needs and wants of the clients. Customers are the source of the inflowing cash and inevitably, this cash is what converts into capital in the long run. The biggest challenge in a capitalistic economy is meeting the needs of the clients, leveraging low costs and accumulating capital. In an attempt to achieve this balance, an antagonistic social relation in the production process is applied by capitalist. Max observed that this behavior will lead to the overthrow of capitalism by proletariat in the long ran. This model is where the means of production will no longer be owned by individuals but a collaboration of individuals leading to communism. The instances extrapolated above provide an understanding of how the capitalistic economy works. It is depicted by a double character; from one extreme are individuals motivated to making money at the expense and exploitation of others. On the other lies individuals working hard to maintain their livelihood and earn a living. 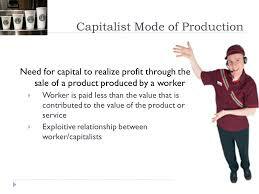 The mode of production is distinctive, where profit is what compels individuals to produce, conjure goods that meet the needs and wants of their customers in order to accumulate capital.